When dealing with gold, it is important to reach way down inside yourself and decide who you are going to be! Integrity is a personal matter. We each make our own decisions about how we will relate to others and the world around us. There are not many true saints around. Most of us have limits whereupon weaknesses or flaws in our character allow us to fall from grace (when we do things differently than we know we should). Most of us are not monsters. So we each place personal limits to which we will not step beyond when it comes to the bad stuff. For example, a person might bend the truth around a bit, but would never steal something that belonged to someone else. Another person might steal small things, but never anything of great value and never from anyone that the person knows. Another person might be willing to pull off any kind of scam to cheat others out of money, but the person would never kill anyone. Perhaps someone in the business of murder would draw the line when it comes to killing someone in his gang or family. We each set our own upper and lower limits by the internal decisions that we make. Then, life-situations push us up and down against these limits, and we are tested. There are few things in life that will test your limits more strenuously than natural, beautiful gold. So it is wise in the beginning to do some introspection and decide where your personal limits are going to be. Anyone who believes they are not going to be personally tested by gold has just not found enough of it yet! I am not a saint, either. So I instinctively knew when I was just starting in gold prospecting that I had some internal decisions to make. Since I really enjoy the activity, and wanted to carve out a place for myself in this industry, I made my decisions early on that this was one area of my life that I was not going to mess up for myself through bad business dealings or unethical behavior. At least in this one area, I decided that I was going to try and do everything the right way. Therefore, I personally never agree to a percentage deal with partners or property owners that I do not fully intend to pay. As part of this, during the time it is in my possession, I never allow myself to get attached to that portion of the gold recovery which belongs to others. Over the years, I have run across people on a regular basis that love gold so much, that I just can’t trust them with it. Gold is great. But you cannot let it take you completely over. In the end, it is a personal decision how deep you are going to allow yourself to get sucked in by gold. Moderation is the key to this. Any game or activity must follow an agreed-upon set of rules, for which there is a certain amount of freedom to act within. These are the same rules that are being formed up when a business agreement is made with partners or the owner of a mining property. You cannot really win a game through cheating. To knowingly break the rules of a game so that you can win, is to admit that the game – by the rules – is above your ability to play. A person has actually already lost the game at the point where he or she needs to cheat or change the rules without the agreement of the others who are playing. This discussion is not about how other people feel about you. It is about how you see yourself. I am talking about the internal mechanisms that people use to bury their own ability to see the truth in things. Natural ability and intelligence fundamentally comes down to being able to recognize the differences between things and to be able to act upon the differences. Whatever that quality is inside of you that can tell the difference between black, grey and white, or the differences between a hundred different shades of gray, cannot be separated from that part of you that is able to see the differences between right and wrong, or the many different shades of right and wrong. We are talking about the same thing. A floor cleaner can tell the difference between a dirty floor and a clean floor. If he is good, he can tell the difference between a clean floor and a sparkling floor. And by being able to differentiate in this way, he will be able to learn exactly how to keep the floor sparkling. That is what makes him a good floor cleaner. This ability stems directly from the ability to see differences and the willingness to act upon them. 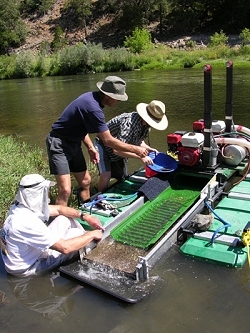 A gold dredger must be able to tell the difference between hard-packed material, and slightly-less hard-packed material. You need to be able to recognize when different layers change. You need to be able to see even the slightest differences in the amount of gold that is present. 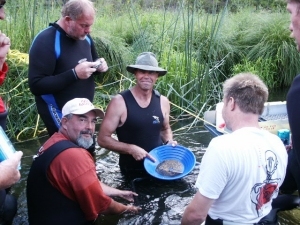 Prospecting is entirely about recognizing and comparing the differences that you see as samples are dredged into the streambed. Recognizing the differences, and then acting upon them, can mean the difference of finding a rich pay-streak, or missing it entirely even when all the signs of its presence were right there in front of you. There are hundreds of tiny signs and things to see and know to succeed well in this field. 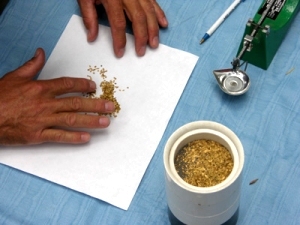 The good gold dredger sees many of these little differences and is able to follow up on enough of the right ones to strike pay-dirt often enough to make the activity worthwhile. This is ability that I am talking about, and it depends entirely upon your capacity to tell the differences between things and act upon them. Personal integrity and intelligence go hand in hand with each other. When you shut down your ability or willingness to recognize the finer shades of right and wrong, you also close off that same part of your ability to see important distinctions that allow you to follow the path of gold into high-grade deposits. Your search for gold through prospecting is really a search for the truth of the way things are. Not the way you want them to be; but the way they really are! No matter how you try to make yourself feel better about it (justification), when you cheat a claim owner or partner out of that portion of the gold that you have already agreed belongs to him (them), you are burying that priceless part of yourself that can see the truth of things. You are making yourself more stupid! So the best answer in gold prospecting is to never cheat. The answer is to be very careful to only make deals that you can honor, and find enough gold that you can more than meet your obligations to the others who are involved. People who are good at gold dredging, and at life, do not need to steal from their partners (called “high-grading” in mining terminology) to succeed and do well at it. You have to kick these concepts around for yourself and figure out where you are going draw your own line. Because, if there is anything in this world that will put your personal integrity to the real test, it is gold! Gold can be very difficult to let go of once it is in your hands. Gold is especially hard to give away when, internally, you do not feel that the recipient really deserves to have what it is coming to him – even if you have agreed to it beforehand. In such a case, with gold, sometimes it might be tempting to not follow through on an earlier agreement. You can find yourself coming up with all kinds of reasons (justifications) as to why you do not need to follow through with the earlier agreements. Justifications can be made to sound very reasonable (to yourself). But if they are that reasonable, why not take them up with the claim owner? Gold is a very tempting substance. You need to be careful to not lose yourself because of it! I always try and work out a complete deal before I go onto someone else’s mining claim or property. There is much to lose by not doing so. If I cannot come to acceptable terms with a claim owner, it is much better to know ahead of time. There is no scarcity of rich gold-bearing river property around. I stay away from bad deals. This way, I do not put my personal integrity at risk in a gold mining venture. I also stay away from making deals with bad people. Such people have a severely contagious disease. Take Joe Blow for example, who is doing pretty well in life and making progress towards his goals. Then one day he takes up a partnership with Pete Schmuck, who is obviously a shady character. Let’s say that Joe has established a pretty strong stand on his own morals, so he does not get pulled down into unethical activities by Pete Schmuck. One day, however, Schmuck finally ends up pulling the big con job on Joe Blow – or on Joe’s associates, which is even worse! Joe gets mad and now feels the need to get even, or to stop Schmuck; or if nothing else, to make things right again with his associates – if that is even possible. But before Joe teamed up with Schmuck, he was doing fine and getting along well in life. See what I mean? Cheaters are sick. They are losers. They are dishonest because they are not capable enough to do things the right way.